Eighteen patients were prospectively enrolled. Fifteen treatment naive patients underwent 11C-acetate PET/MRI before transurethral resection of bladder tumor (TUR-BT) for primary tumor evaluation. Five patients with muscle invasive BC were imaged after NAC and prior to radical cystectomy (RC) with extended pelvic lymph node dissection (ePLND) for NAC treatment response evaluation. Two patients were part of both cohorts. 11C-acetate PET/MRI findings were correlated with histopathology. Accuracy for lymph node detection was evaluated on patient and the ePLND template (10 regions) levels. The sensitivity, specificity and accuracy of 11C-acetate PET/MRI for the detection of muscle invasive BC was 1.00, 0.69 and 0.73 while the area under the receiver operating characteristic curve (95% confidence interval) was 0.85 (0.55–1.0), respectively. All five NAC patients underwent chemotherapy as planned and 11C-acetate PET/MRI correctly staged three patients, overstaged one and understaged one patient compared with RC and ePLND findings. A total of 175 lymph node were removed, median of 35 (range, 27–43) per patient in five patients who had RC and ePLND while 12 (7%) harboured metastases. Sensitivity, specificity, accuracy and AUC for N-staging were 0.20, 0.96, 0.80 and 0.58 on the ePLND template (10 regions) level. 11C-acetate PET/MRI is feasible for staging of BC although sensitivity for the detection of nodal metastases is low. Monitoring response to NAC shows promise and warrants evaluation in larger studies. Approximately 77,000 new cases of bladder cancer (BC) are diagnosed annually in USA . In Europe, based on EU science hub estimates, incidence of new BC cases was 131,000 in 2015, but there is large variability between different countries . Staging is based on TNM system . Ta tumors are treated with transurethral resection of bladder tumor (TUR-BT). T1 and carcinoma in situ (Tis) tumors have risk of progression and intravesical immunotherapy with Bacillus-Calmette-Guerin (BCG) instillations is used to obtain local control and organ preservation . Muscle invasive bladder cancer (MIBC) is an aggressive disease and standard treatment is radical cystectomy (RC), accompanied by pelvic lymph node dissection (PLND) . In addition to radical surgery, neoadjuvant chemotherapy (NAC) has been demonstrated to increase overall survival in MIBC and is recommended by consensus guidelines [5, 6]. Staging of BC remains suboptimal with standard imaging modalities such as computed tomography (CT) and anatomical (T2- and T1-weighted imaging) magnetic resonance imaging (MRI) [7, 8]. Compared to contrast enhanced CT, MRI has better soft tissue contrast which may improve local tumor evaluation . Locoregional staging in particular is difficult, since normal-sized lymph nodes may harbour metastases. The use of ultra-small paramagnetic particles of iron oxide (USPIO) has shown some promise in the detection of nodal metastases with MRI [10, 11] but still remains an experimental approach with very limited availability. Positron emission tomography-CT (PET/CT) imaging has been widely investigated in BC in an attempt to improve nodal staging but with limited success [12–15]. PET/MRI is a novel combination of two imaging modalities which could potentially offer advantages for evaluation of MIBC over PET/CT. Only a limited experience in staging of BC is available with PET/MRI and specifically studies of tracers with low excretion in urine are lacking . Hence, we undertook the current study to evaluate 11C-acetate PET/MRI in initial staging and estimation of response to NAC in patients with BC. The study was approved by the ethical committee of Hospital District of Southwest Finland and registered at ClinicalTrials.gov (NCT01918592). Candidates for study were screened in cystoscopy units in three participating university hospitals. Eligible patients signed written consent after verbal and written information. All patients were imaged with an Ingenuity TF PET/MRI scanner (Philips Medical Systems, Cleveland, OH). Details of the physical performance of the system have already been reported . Before imaging, each patient had a Foley catheter inserted holding 10 ml glycine in balloon and the bladder was consequently filled with 100 ml sterile saline. The patients were placed supine on the scanner table. After completed MR-based attenuation correction (see below) the table was rotated for PET scan and a median dose of 713 (range, 654–796) MBq of 11C-acetate was injected intravenously and PET acquisition (two 4-min table positions) covering the whole pelvis was immediately started. MR-based attenuation correction (MRAC) was performed using the vendor-provided method. The anatomical MR acquisition (atMR) for MRAC was performed using Repetition Time/Echo Time (TR/TE) 4.0/2.3 ms and flip angle 10°. Subsequently, MRAC algorithm converts the atMR images by segmentation and classification to attenuation correction maps containing air (0.0 cm− 1), lung (0.022 cm− 1) and soft tissue (0.096 cm− 1). This MRAC map was then used in PET image reconstruction. All quantitative corrections were applied to this reconstruction taking into account detector dead time, radioactivity decay, random, scatter and photon attenuation. PET images were reconstructed in a 144 × 144 matrix with an isotropic voxel size of 4 mm following a fully 3-D maximum-likelihood ordered subsets expectation maximum (LM-OSEM) algorithm with 3 iterations and 33 subsets using TOF technology. After the PET scan, bladder was emptied and radioactive urine was safely disposed. Bladder was re-filled with 100 ml sterile saline and MRI examination was performed. T2-weighted imaging was performed using single-shot turbo spin echo sequence with TR/TE 3618/130, field of view (FOV) 300 × 300 mm2, acquisition voxel size 1.25 × 1.25 × 3.00 mm3, reconstruction voxel size 0.69 × 0.69 × 3.00 mm3 in axial (acquisition time 1:30 min), sagittal (acquisition time 1:30 min) and coronal (acquisition time 1:12 min) planes. 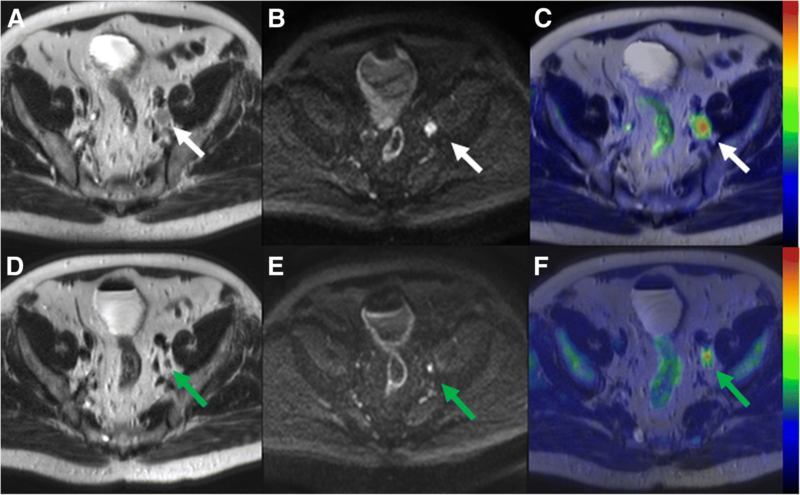 Diffusion weighted imaging (DWI) covering whole pelvis was performed using a single shot SE-EPI sequence, monopolar diffusion gradient scheme, and the following parameters: TR/TE 3148/45, FOV 300 × 300 cm2, acquisition voxel size 2.5 × 2.5 × 4.0 mm3, reconstruction voxel size 1.25 × 1.25 × 4.00 mm3, b value 0 and 800 s/mm2, diffusion gradient timing (Δ) 21.6 ms, diffusion gradient duration (δ) 8.3 ms, diffusion time (Δ-δ/3) 18.8 ms, SENSE  factor of 2, partial-Fourier acquisition 0.69, SPAIR fat suppression acquisition time 1:47 min per position (two positions in total). Additional T2-weighted imaging in axial plane with the same slice location as DWI covering whole pelvis was obtained using TR/TE 3148/45, FOV 300 × 300 cm2, acquisition voxel size acquisition voxel size 1.25 × 1.25 × 4.00 mm3, reconstruction voxel size 0.69 × 0.69 × 4.00 mm3, acquisition time 1:05 min per position (two positions in total). Additional B0 and B1 mapping were performed. Multiple additional experimental DWI acquisitions, a spin locking method were acquired but not analyzed in the current study . Detailed importable PET/MRI protocol is provided in the supporting material. PET/MRI images were evaluated by two radiologists (IJ, JV) in conjunction with an experienced nuclear medicine physician (JK). Primary tumor size, possible muscle invasion and metastatic spread was evaluated . Lymph nodes were evaluated on pre-determined 10 regions (suspicion of metastasis vs. benign) as described in Fig. 1. A diagnostic TUR-BT followed imaging after a median of 11 (range 1–21) days (Fig. 2) in the primary tumor evaluation of 15 patients. A complete resection was performed in each case and imaging findings did not affect the extent of the procedure. Further treatment after TUR-BT was done according to standard guidelines [5, 21]. In addition to 15 patients who underwent PET/MRI before TUR-BT, three MIBC patients were enrolled after TUR-BT for NAC treatment response evaluation. NAC treatment response was evaluated in five patients (Table 1). Two patients in this study phase were part of both phases. Five patients received either 3 or 4 cycles of cisplatin-gemcitabine according to treating hospital policy. Second 11C-acetate PET/MRI imaging was performed a median of 21 (range, 11–33) days after completion of NAC. Finally, open RC and extended (E) PLND were performed according to predetermined ten fields described in Fig. 1. Delay from NAC completion to RC was 36 days (range 28-47 days). The selected EPLND template was based on commonly known lymphatic spread pathways . In addition to extent of primary tumour, each predetermined PLND area was separately analysed from the PET/MRI data sets. For the histopathological examination, the RC specimen and the ten PLND areas were sent separately and were analysed by an experienced uropathologist (PT). The statistical analysis was performed using Matlab (version r2013a, The MathWorks Inc., Natick, MA). Sensitivity, specificity and accuracy of 11C-acetate PET/MRI for BT staging in 15 patients who underwent PET/MRI before TUR-BT was compared with TUR-BT histopathology specimens as ground truth. The classification was performed in binary class: benign + non-muscle invasive (Ta/Tis/T1) vs muscle invasive (T2-T4). In five patients presenting with MIBC who underwent RC and PLND, regional classification (10 regions of interest, in total 50 regions) between benign vs malignant LNs was performed. Additional patient level analysis was performed. Receiver operating characteristic curve analysis was used to evaluate ability of 11C-acetate PET/MRI for primary staging and detection of lymph node metastases. Area under the receiver operating characteristic curve (AUC) values were calculated using the trapezoid rule. Ninety-five percent confidence interval for AUC values were calculated from 100,000 bootstrap samples. SUV measurements were compared using Bonferroni multiple comparison test . In total, 15 patients underwent the primary tumour evaluation and five response evaluation with two patients participating in both groups giving a total of 18 participants. Patient characteristics are presented in Table 1. Despite careful and hygienic catheterization three patients (17%, 3/18) developed urinary tract infection after imaging. Two patients subsequently required hospitalization while one patient received antimicrobial treatment at home. In these three patients underlying bacteriuria could not be ruled out since bacteriuria had not been screened before or at the time of enrolment. All primary tumors were urothelial cancer and demonstrated positive uptake of 11C-acetate. The median maximum standardized uptake value (SUVmax) was 2.9 (range, 1.3–4.7). There was no difference between SUVmax of MIBC versus superficial (clinical stage Tis-T1) BC. The sensitivity, specificity, accuracy and AUC (95% confidence interval) values of 11C-acetate PET/MRI for the detection of MIBC (primary BT staging) were 1.00, 0.69 and 0.73, and 0.85 (0.55–1.00), respectively (Figs. 3 and 4). The individual differences for all 15 patients between 11C-acetate PET/MRI and TUR-BT are presented in Table 2. All five patients with MIBC underwent NAC and had RC and EPLND. NAC was generally well tolerated and all 5 patients received the planned amount of cycles but dose adjustment of anticancer drugs was necessary for 2 patients before surgery. Comparison of 11C-acetate PET/MRI and histopathological evaluation on patient level are presented in Table 3. Compared to histopathology 11C-acetate PET/MRI correctly staged three patients (Figs. 4 and 5), overstaged one (Fig. 6) and understaged one patient. True negative findings in BT were reported in two patients and true positive in one patient, respectively. Details are presented in the Supporting Material. The median number of evaluated nodes per patient was 35 (range 27–43). Of a total 175 LNs removed, 12 (7%) harboured metastases. On patient level, two of the five patients had nodal metastatic disease (Table 4, Fig. 5). 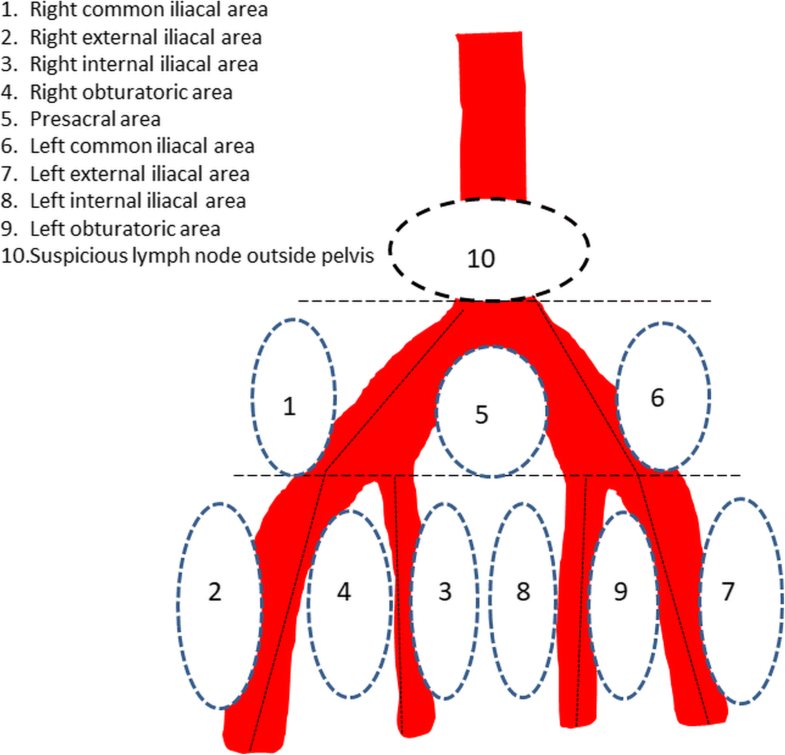 All metastatic LNs were found around the iliac arteries and none were identified outside the pelvis (Fig. 6). The sensitivity, specificity and accuracy of 11C-acetate PET/MRI for the detection of LN metastases on the predetermined 10 nodal areas were 0.2, 0.96, 0.88, respectively, and AUC (95% confidence interval) value was 0.58. The corresponding values on patient level were 0.5, 0.67, 0.6, and 0.58 respectively (Table 4). This prospective registered clinical trial is the first study to demonstrate feasibility of 11C-acetate PET/MRI in BC staging and its potential to assist in monitoring response to NAC. Compared to CT, MRI as the anatomic modality may be favoured since CT is poor for evaluation of muscle invasion. 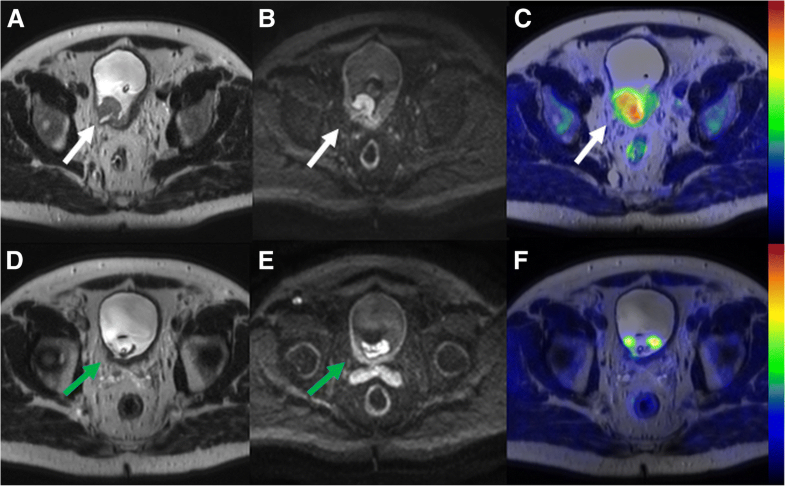 Similar to prostate cancer , 11C- acetate PET/MRI does not seem to offer a satisfactory solution for the detection of metastatic LNs in pelvis due to limited accuracy. 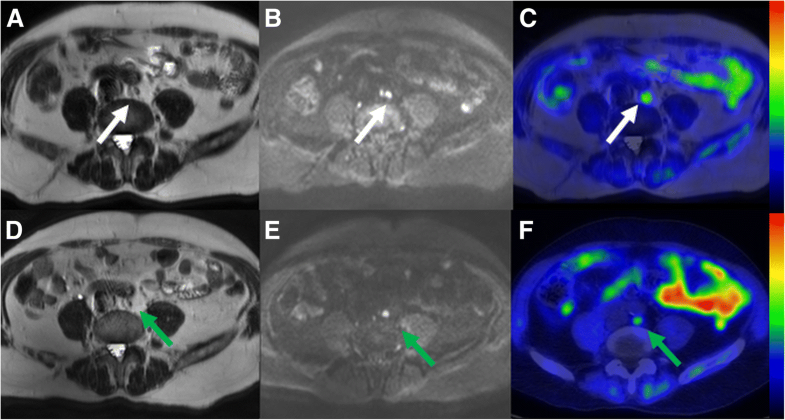 11C-acetate PET/MRI demonstrated accuracy of 0.73 in primary tumor staging, detection of MIBC. In previous studies higher accuracy of MRI alone has been reported . Green et al. noted, however, that differentiation between T1 high grade tumor and T2 tumor is challenging even with known histopathology and TUR-BT stage. Two studies of PET/MRI after TUR-BT or with proven history of BC using 2-deoxy-2-[18F]fluoro-D-glucose (18F-FDG) report high activity in urinary system and in inflammatory tissue [26, 27]. This is clearly detrimental for evaluation of BT because of suboptimal target-to-background ratio. In the current trial, treatment naive patients with suspicion of muscle invasion in cystoscopy were imaged minimizing the impact of inflammatory reaction post TUR-BT. 11C-acetate did not miss any MIBC cases and we hypothesise that 11C- acetate could outperform 18F-FDG since accuracy of 18F-FDG is limited by urine extraction. Although overstaging affected accuracy in the current trial, it is less significant as clinical challenge than understaging, which is a common cause of treatment delay, meaning execution of RC and ePLND. Only three studies, all published in 2012, reported evaluation of 11C-acetate PET/CT in bladder cancer. Vargas et al. reported on 16 patients and compared MRI, CT and 11C-acetate PET/CT before cystectomy and PLND. They concluded that while all three modalities had similar accuracy PET/CT carried a risk of understaging . Orevi et al. found in a study of 13 patients that 11C-acetate PET/CT was positive in 10 LNs, of which five were malignant giving a specificity of 50% . Finally, Schröder et al. demonstrated that 11C-acetate PET/CT showed specificity of 50% and sensitivity of 80% for the detection of LN metastases. They also noted that intravesical instillation therapy with BCG yielded falsely high positive findings in the resected tumor bed of bladder wall as well as in LNs. . Similar problems were seen by Vargas et al. . In comparison to all these three PET/CT studies [13, 15, 28] in the current trial, specificity of 50% on patient level for detection of regional metastases was found. If one patient with hip prostheses was discarded, sensitivity would have been 100%. It is tempting to assume that 11C-acetate PET/MRI is comparable or better than PET/CT for primary tumor evaluation. However, there are no studies directly comparing PET/CT to PET/MRI in bladder cancer staging and, therefore, the issue remains a matter of further research. Our registered prospective trial is the third 11C -acetate study evaluating LNs in BC. However, 11C -acetate and PET-MRI have not been used as a surrogate modality before [13, 28, 29]. A pilot study demonstrating the utility of 18F-FDG PET/MRI in BC staging has already been conducted . The results seem to favour PET/MRI in LN evaluation compared to MRI alone, but the number of study subjects was low and needs to be verified in larger studies. Orevi et al. demonstrated that 11C-choline and acetate were comparable in evaluation of lymph node metastases , and recent meta-analytic study  reports for both tracers low sensitivity and moderate specificity while heterogeneity of publications limits further conclusions. Our sensitivity of 20% in LN staging is in line with the meta-analysis and we could conclude that the optimal tracer for evaluating urinary tract and pelvic LNs remains to be found. Studies comparing PET/CT vs. PET/MRI for the detection of lymph nodes are lacking. 18F-FDG PET is widely available and has been studied in multiple studies enrolling BC patients, but prior studies were mainly performed with PET/CT and some compared to CT alone [30–32]. Overall, the results are conflicting. Swinnen et al. found no benefit from adding PET to CT alone . 18F-FDG is highly active in urinary system and forced urinary protocols and delayed execution of PET imaging have been shown to improve performance of 18F-FDG PET/CT . Using these methods, excessive hydration and use of diuretics can also be considered an extra burden for the patient. Although the published evidence does not support routine use of PET-imaging for BC staging, our results indicate that 11C-acetate is a viable tracer option in BC staging. Our study has several limitations. First, the number of patients especially evaluated for NAC response was low. Furthermore, patient no. 3 in NAC treatment response group had bilateral hip prostheses, which caused B0 field distortions and the image quality was not optimal. We hypothesize that the patient’s largest metastatic 2.0 cm LN would not have been missed if B0 field distortions were fully compensated. Although excellent therapy responses were found (Figs. 4 and 5) the low number of patients precludes definite conclusion about the value of 11C -acetate PET/MRI in setting of therapy response evaluation. In contrast, compared to previous studies a higher number of treatment (n = 15) naive patients underwent baseline imaging, and allowed us to evaluate performance of 11C -acetate PET/MRI without contribution of inflammation to findings. To decrease heterogeneity in future studies, BCG or chemotherapy ideally should not be given before initial PET-MRI or PET-CT. In the current trial T1-weighted imaging and dynamic contract enhanced MRI were not performed. Before conducting this trial, we have performed very careful optimization of MRI acquisition protocol, done multiple iterations of the acquisition protocol, and carefully optimized the acquisition protocol with special attention on DWI. As can be seen in Figs. 3, 4, 5 and 6, DWI was the “workhorse “for TNM staging of BC. In order to increase openness of our trial, promote #opensource research (#OpenSourceTrial), we share our optimized MRI acquisition protocol in supporting material. In conclusion, we found a moderate accuracy for staging of primary BC using 11C-acetate PET/MRI in this pilot prospective registered clinical trial. In contrast, only a limited sensitivity for detection of metastatic lymph nodes and response to neoadjuvant chemotherapy was found. Our findings do not advocate for routine use of 11C-acetate PET/MRI in staging of BC but consideration of its potential role in future organ preservation trials with combined use of imaging and other markers, such as molecular information, is warranted. Heikki Minn and Peter J. Boström contributed equally to this work. The study was approved by ethical committee of Hospital District of Southwest Finland and registered in ClinicalTrials.gov (NCT01918592). Candidates for study were screened in cystoscopy units in three participating university hospitals. Eligible patients signed written consent after verbal and written information. The manuscript contains images of a participating patient. Authors have written permission to publish anonymous data. The consent form is in Finnish language and follows Finnish law 488/1999 6§. Copy of the signed consent is provided by the corresponding on a reasonable request. The study was funded by Finnish Governmental Special Funding grant to the department of Urology, Turku University hospital, and by a research grants by the Sigrid Juselius Foundantion, the Finnish Urology association and Finnish cultural foundation. AS, IJ, PB designed the study; AS, IJ, OE, H.M. and PB wrote the manuscript; AS, IJ, HM performed statistical analysis; IJ, JK, JV performed imaging interpretation; PT performed pathological analysis; AS, IK, JS, EV enrolled the patients; All authors critically evaluated manuscript. All authors read and approved the final manuscript.